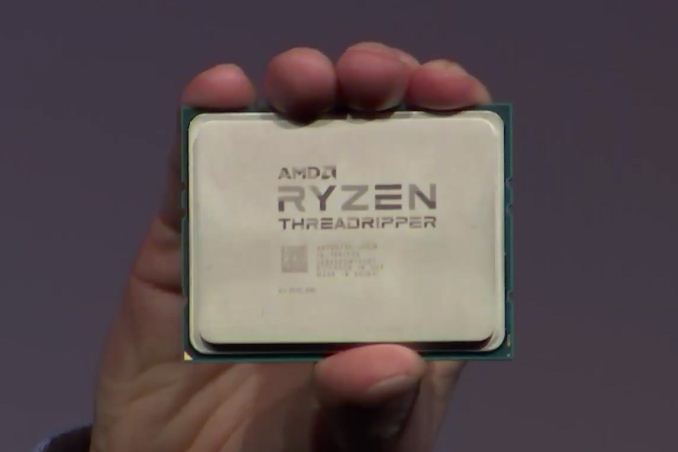 AMD has released details about their soon to be released Threadripper and Threadripper looks good on paper. With up to 16 cores and 32 threads and Quad channel DDR4. Intel has accused AMD of gluing together dies in AMD’s EPYC design which to some smacks of a smear campaign> We will likely hear about Ryzen Threadripper being two glued together Ryzen chips. Maybe the recent smears are a sign Intel is worried about the lower price Threadripper offers. On AMD’s side of things Zen cores were built for scalability and Threadripper is no exception. Ryzen is a single die chip and considered AMD’s HEDT (high end desktop), Ryzen Threadripper would double Ryzens horsepower “glued” or not. Threadripper is two ZEN micro-architecture dies on one chip effectively doubling Ryzen and requiring a new socket, LGA yes LGA Large Grid Array 4094 pin. Weighing in with 16 cores and up to 32 MB of L3 cache driving Quad channel DDR4. We have seen Threadripper called a Super-High End Desktop or Shed. 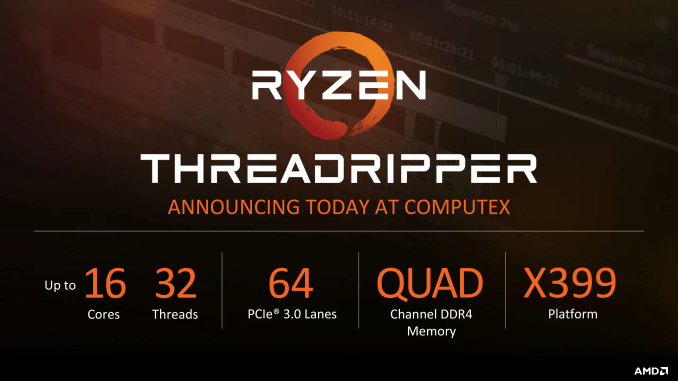 Will ThreadRipper ship with AIO water cooling included? Why would we need water cooling you might ask? Well, water cooling is probably a good idea on a chip as wide as four fingers in a 4096 socket with a TDP of 180 watts (based on the TDP of 95W per 1800x). We may not see these beasts running without water cooling and AMD has made no bones about calling them AMD Ryzen Threadripper. We wonder why scalability is a problem hearing from Intel’s side who is offering new scalable server solutions with their Xeon chips and in the past marketed the old “Double Cheeseburger” Q6600 which was in effect two dual cores glued together so we would suspect a little case of the pot calling the kettle black. We don’t really care if Ryzen Threadripper is two dies married but at 180W TDP we doubt you will see many of these in virtual currency mining rigs! We see it this way Intel has the Intel Xeon E5-2697A v4 Sixteen-Core Broadwell Processor 2.6GHz 9.6GT/s 40MB LGA 2011-3 CPU, OEM version at $2619 and Threadripper offers 16 core 32 thread at $999. Of course Intel’s Core i9-7980XE at $1999 later this year but full details aren’t known but at a cool $1999 few enthusiasts will dig that deep. So AMD hits with a $999 16 core 32 thread CPU and it probably won’t keep stride with an Intel 16 core 32 thread chip but if Intel’s offering isn’t doing double the work who benefits from Threadripper? Well, we wouldn’t mind saying yes that’s a 16 core 32 thread chip in our machine Threadripper or Intel but at these prices for us it would probably be Threadripper!